Strae set in woodland with a small burn running close by is is approximately 5 minutes walk from the quiet village of Dalavich is set on the western shores Loch Awe and within the Inverliever Forest in the Western Highlands. 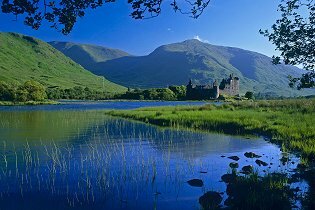 Loch Awe boasts several islands which home ruined castles of which Kilchurn Castle is one of the most photographed castles in Scotland. The Cruachan Power Station visitor centre offers tours deep into the Ben Cruachan mountain where a huge cavern houses the massive turbines. The remote location provides the ideal home to an amazing array of wildlife from the famous Scottish wildcats, red and roe deer, pine martens, otters, red squirrels and often golden eagles, sea eagles and ospreys can been seen too. A great choice of walks and cycle trails are abundant throughout the forest and local area and a great way to enjoy the scenery and its wildlife. Don’t miss the popular Onich Falls nearby. Oban is the nearest large town, a lovely harbour town with excellent fresh seafood, variety of shops, its own distillery and the ferry gateway to the Western Isles. Fishing - Loch Awe is widely regarded as the Scotland’s premier ‘wild’ fishing loch and renowned for its trout fishing. At approximately 25 miles long it is one of the largest Scottish freshwater lochs and offers some of the best fishing in Scotland. The largest ever brown trout ever recorded at 32lbs was caught on Loch Awe. Season dependent it is also and great for sea trout, salmon, pike, perch and char. Boat hire for recreation and fishing is available at Dalavich, fishing rights are included in the hire of any of the cabins. Loch View Bar & Grill by south entrance to site - Great food and friendly community run bar. Opening times vary according to time of year. We cannot guarantee opening hours during low season, so please confirm before booking. Wild Rowan shop / cafe / part time Post Office. Provides good food all day (including takeaway) & supplies basic provisions, in a very friendly atmosphere. Also sells fishing permits, fishing tackle, outdoor & BBQ equipment. Dalavich Social Club organise many functions within the wonderful Community Centre building.